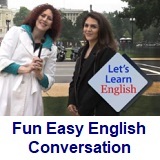 ﻿ Fun Easy English - new classroom free online classes english language lessons speaking listening writing reading march 16. 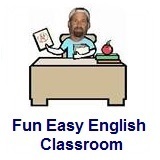 Today in the Fun Easy English classroom you are going to learn new vocabulary using word groups and Fun Easy English flashcards. Although the flashcards are for kids, still plenty of fun for adults too. Enjoy. Hi. In the classroom today you will learn new vocabulary using word groups. Word groups are a fun way to learn new English vocabulary. In each group of four words, one word does not belong. For example, in this group of four words, three words belong together and one word does not belong. The answer is C, or tree. The other three words are parts of a car. Make up your own word groups on index cards and use this as a way to learn new English words. 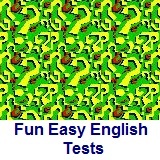 Hey I wanted to make sure all of you know about the Fun Easy English vocabulary section. Many new lessons will be added this year including lots of flashcards. These vocabulary lessons are good for kids and adults. This is a test of your understanding of word groups. For each question decide which word does not belong with the others. There are 50 questions. Good luck. 2. Which word does not belong with the others? 3. Which word does not belong with the others? 7. Which word does not belong with the others? 8. Which word does not belong with the others? 9. Which word does not belong with the others? 10. Which word does not belong with the others? 11. Which word does not belong with the others? 12. Which word does not belong with the others? 13. Which word does not belong with the others? 17. Which word does not belong with the others? 18. Which word does not belong with the others? 19. Which word does not belong with the others? 20. Which word does not belong with the others? 21. Which word does not belong with the others? 22. Which word does not belong with the others? 27. Which word does not belong with the others? 28. Which word does not belong with the others? 29. Which word does not belong with the others? 30. Which word does not belong with the others? 31. Which word does not belong with the others? 32. Which word does not belong with the others? 33. Which word does not belong with the others? 34. Which word does not belong with the others? 35. Which word does not belong with the others? 36. Which word does not belong with the others? 37. Which word does not belong with the others? 38. Which word does not belong with the others? 39. Which word does not belong with the others? 40. Which word does not belong with the others? 41. Which word does not belong with the others? 42. Which word does not belong with the others? 43. Which word does not belong with the others? 44. Which word does not belong with the others? 45. Which word does not belong with the others? 46. Which word does not belong with the others? 47. Which word does not belong with the others? 48. Which word does not belong with the others? 49. Which word does not belong with the others? 50. Which word does not belong with the others? In this lesson Anna interviews musician Emma G on her show. But, her excitement starts to become a little....strange.